Last month, WD presented the WD Black2, the first hard drive ever to offer 1 TB of “conventional” space through a mechanical disk and a 120-GB in the same device, so this isn’t a hybrid but a dual hard drive. Today, we will review this disk in detail so you know everything you need to know about it. Welcome to the WD Black2 review. This dual hard drive can be installed on any 2.5-inch bay, so it’s ideal for laptops with a single bay. You can use the 120-GB SSD for the OS and the 1-TB mechanical disk to store your data. The new WD Black2 features a SATA3 interface, so you can expect the best results. WD has said nothing about the controller of the SSD, but considering the Reading (350 Mb/s) and writing (140 Mb/s) speeds, it doesn’t seem to be a well-known one. However, the integrated SSD has a life time of 600000 cycles, and WD offers a 5-year warranty. Not much has been said about the mechanical 1-TB part, so we assume it’s a traditional 5900 rpm disk. The WD Black2 comes in a very luxurious-looking package. The box is gold and black and looks like a chest. The WD Black 2 comes with some truly unconventional accessories. Not counting the user manual, it comes with an USB key, “Web Key” according to WD, to directly access the installation software at WD’s website –an unnecessary but original feature-. There’s also a SATA-USB 3.0 adapter (finally someone uses USB 3.0 for this!) to clone your hard drive in your system. Then we have the WD Black2. As you can see, it shares the black and gold design with the package. On the bottom part, you can see the label and the integrated circuits. The differences between a WD Black2 and a 3.5-inch conventional disk are noticeable. There are several ways to configure the WD Black2, and the most useful is cloning the disk to our system. By using the software you can download at WD’s website and the SATA-USB 3.0 adapter, you can clone your current hard drive to the WD Black2, so you can use it as if it’s your old hard drive, evidently with the advantages and features the WD Black2 offers. Only the SSD part of the disk can be used for this purpose, though, so make sure the disk you want to clone has 120 GB of data or less. We’ve simply chosen to connect the WD Black2 normally to test its performance, as well as to tell you how to use it and enable it from scratch. After connecting it, we go to Windows Disk Manager. You need to download and install the official WD software to access the 1 TB mechanical part of the device. Connecting your Web Key will automatically start the download, and you can also download Acronis True Image WD Edition, a disk cloning tool. Once you’ve downloaded and installed it, you can access both parts of the disk. Before beginning the tests, there’s something we have to tell you: both the operating system and many testing tools detect the WD Black2 as a single hard drive, despite being actually two in one: SSD and HD. Therefore, the test first test the SSD part and then the mechanical part while performing a single test, showing a very high performance that, naturally, then decreases. Like we previously mentioned, Aida64 shows a very high performance at the beginning (487.5 MB/s) which corresponds to the SSD, and then the speed is cut by about half, now measuring the performance of the mechanical part of the disk. It also shows it has a total capacity of 1043.3 GB. You can see it for yourself in the next picture (our main disk is a 2-TB SATA3 WD Black). Now that we know this little “feature” of the WD Black2, let’s continue. This software did detect the SSD and HD of the Black2 as independent disks, so we tested each one separately. 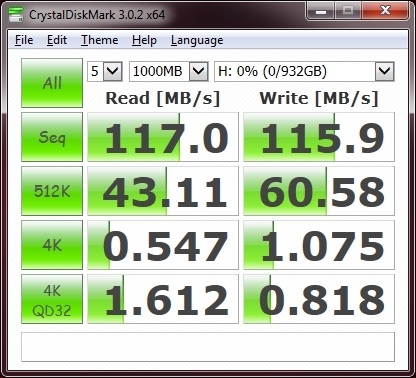 CrystalDiskMark shows a very high performance, even higher than the official specs from WD (350 MB/s, while the software showed a performance of 417.6 MB/s). The mechanical part of the device shows the common performance of a 5900 rpm disk. 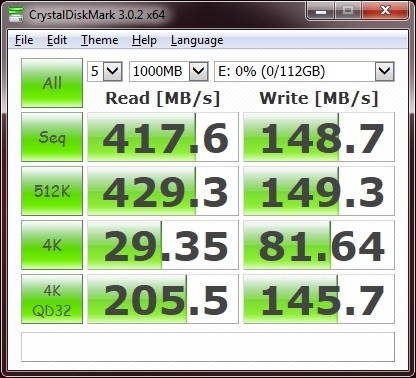 This benchmark offers valuable information, since we don’t know the SSD controller of the WD Black2. We now know, however, it features asynchronous NAND, as it doesn’t perform too well with compressed files. HD Tune shows what we told earlier in more detail. Take a look at the sudden difference in performance between the SSD and mechanical parts of the device. In any case, the performance of the WD Black2 is excellent, even better than the official performance data from WD themselves. The WD Black2 will undoubtedly be very helpful for those looking for the speed of an SSD and the great storage capacity of a mechanical disk at the same time. It’s perfect for your ultra book, All in One or desktop computer (though it’s been designed for laptops). Its performance, while inferior to the performance of a high-end SSD, is better than expected, making this 120GB SSD a very solid device. If you add the 1 TB mechanical disk, you get a brilliant, versatile and very useful disk. Includes Acronis TrueImage HD, a very useful cloning tool. You need to install the software to access the mechanical part of the disk. We give it 8.3 out of 10. The WD Black2 has earned our gold medal thanks to its design and performance. Like we said, it has something for everyone, but don’t expect it to be inexpensive.